Story: Joe Piper is a small time crook in Duckburg. 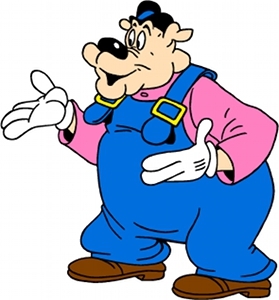 Background notes: Joe Piper first appeared in the Mickey Mouse newspaper strip in 1938 in the story The Plumber's Helper, which ran from July 2nd to December 10th, The story is mostly notable for its first appearance of Detective Casey, and Floyd Gottfredson never used the character again. With the exception of a few covers, on Italian comics, the character was not seen again until 1961 in the Italian Topolino (libretto) #290, and until now he has only been seen in a few stories. So far the Italians have published around 14 stories with Joe Piper, the last one being from 2009. There are no records of Joe Piper appearing outside the comic books.